Do you ever invent something and then find out that everyone else has already done it? I thought up what I thought was a brilliant idea for this little bird mobile a few weeks ago, and since then I've seen several (better!) bird mobiles out there in the blogging world :o) Oh well! I decided to make mine anyway, and here is how it turned out! 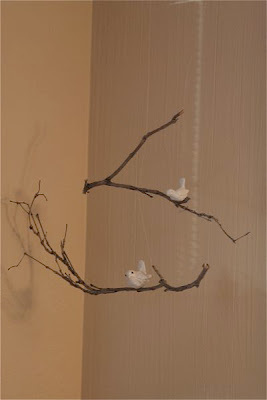 I used old limbs from a tree I trimmed a little while ago, and little white birds that I've collected randomly. I've heard that the dollar store sells little birds that you can spray paint! My birds, amazingly, both came with little clips on the bottom, which made attaching them really easy. But if your birds don't have clips, a glue gun should do the trick! 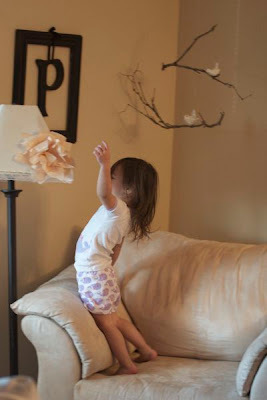 Then I just tied them together with fishing wire, and hung it from the ceiling. 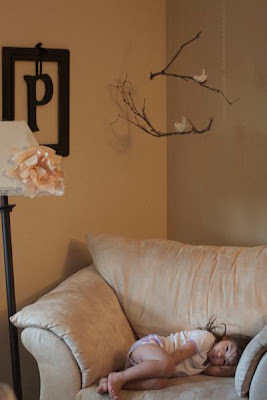 If you don't have little birds, it would be pretty with just fall leaves, too! Or flowers in the spring! I love your bird mobile. How clever. I've never seen anyone else's; so I have nothing to compare them to. I may do this. I also love your silhouettes. The silhouettes would make great gifts. I really appreciate that you always share how to do these projects because I would never be able to figure them out on my own, and I want to do both! I need to go through your whole blog and see what other cool things you've made that I can make. Thanks again! It's really cute! Love it! It's great! You did a great job. So cute! I love it and it looks really beautiful with your decor. Happy Saturday Sharefest from SITS! Your home looks so serene! The bird mobile is the perfect touch! I love yours! I love that entire room too! Just ran across your blog...LOVE your mobile. It's so much fun! I hope it's okay if I copy this exact thing for my house! So, so sweet. Love it, love it all. love it! but ihave to ask.. how do u hang it from the ceiling? disney, i am so inspired by your bird mobile that im gonna make a version too. 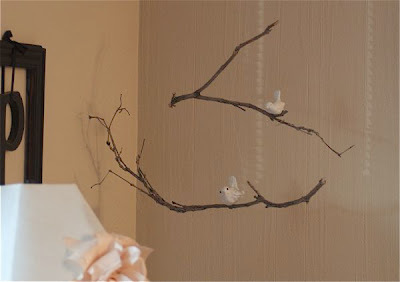 you have so craftily and cleverly disguised the bareness of the wall..and the bird mobile itself is just so charming to look at! it looks no where close to the common bird mobile, its so unique!! do check them out at my blog; i'll also mail you.. This would go so well in my daughter's room!! LOVE this idea...and Ive been collecting little birds (from the dollar store as you mentioned) and I know exactly what to do with them now!